Growth, morphological traits, and mycorrhizal colonization of fine roots show high degree of plasticity in response to changes in nutrient availability, causing shifts in root nutrient-foraging strategy. However, little is known about how this plasticity associated with root branching orders respond to atmospheric nitrogen (N) deposition in subtropical coniferous forests. We used soil block sampling method to examine the responses of six key root functional parameters (including three morphological traits (specific root length (SRL), root tissue density (RTD), and root diameter), two growth indices (total root length (TRL) and biomass) on an areal basis across five root orders, and ectomycorrhizal (EM) tip colonization) to different doses and species of N addition in a slash pine (Pinus elliottii) plantation in subtropical China. TRL, root biomass in all root orders, and EM tip colonization increased significantly with N addition. However, SRL, RTD, and root diameter did not change in any root orders. In comparison to low doses of N input, high doses of N input exerted greater effects on lower-order roots. In regard to species of N added, stronger responses in lower-order roots were observed under ammonium-based than nitrated-based N input. Foliar P content was significantly decreased and stoichiometric N:P ratio was markedly increased in response to high dose of ammonium-based N input. Fine root growth and EM tip colonization displayed higher degree of plasticity than morphological traits in response to N addition. The plastic responses were not root-order dependent, but dependent on both N dose and species, especially for ephemeral lower-order roots that are mostly like to be the main nutrient acquisition structures. 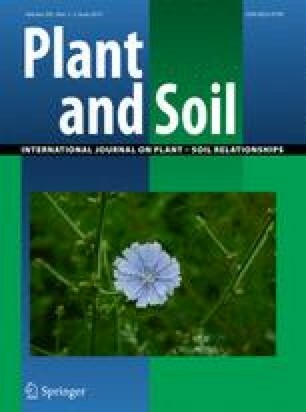 Our results imply that while N limitation was alleviated by exogenous N input, P limitation may persist or even be exacerbated, thus causing an increase of absorptive root length, biomass, and dependence on ectomycorrhizae for nutrient acquisition in subtropical slash pine plantation forests. The online version of this article (doi: 10.1007/s11104-015-2420-x) contains supplementary material, which is available to authorized users. This research is financially supported by the grants from the National Natural Science Foundation of China (No. 31130009) and the National Key Project of Scientific and Technical Supporting Program (No. 2013BAC03B03). Special thanks are due to the Qianyanzhou Experimental Station of Red Soil and Hilly Land, Chinese Academy of Sciences, Jiangxi province, China, for permission to work in their permanent slash pine plantation experiment plots. Thanks to all the staff and students of the Qianyanzhou Experimental Station for their assistance in the field work. The authors acknowledge the contributions of the anonymous reviewers.